Any sports fan has heard of the dreaded ACL tear—the destruction of the anterior cruciate ligament, which runs diagonally across the middle of the knee. An injury that has sidelined more than a few professional athletes and ruined the NFL career prospects of many more, it is also the most common sports-related injury treated by the orthopedic and sports medicine team at Rady Children’s Hospital-San Diego’s 360 Sports Medicine program. 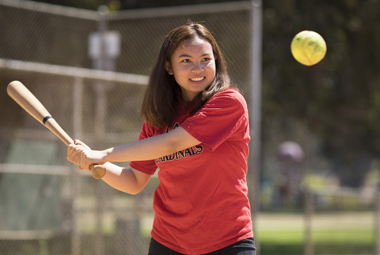 For Rady Children’s patient Mary Le, it was softball, not soccer, that led to her ACL reconstruction surgery in August 2015. Then a sophomore at Hoover High in City Heights, Le suffered a complete tear of her ACL and her meniscus, which cushions the knee. It was a painful injury that took her out of the game and off her feet for the first and only season of her softball career, leading her to Dr. Pennock at Rady Children’s for his treatment recommendation. The brightest upside of Le’s experience at Rady Children’s was the career path it’s led her down since. Her time spent at the Hospital inspired her to participate in FACES for the Future, an academic and job prep program that guides students toward healthcare careers. Through FACES, Le was even able to observe another ACL surgery performed by Dr. Pennock—who had coincidentally been inspired to become a surgeon himself after suffering a sports-related injury in high school. Le is now studying pharmacological chemistry as a freshman at UC San Diego, with the hopes of becoming a pediatric surgeon—a goal she credits to Rady Children’s.